Ansonia quarterback Hunter Buckingham (4) looks for an open receiver down field during his teams’ game at Tri-Village on Friday night. The Tigers defeated the Patriots, 42-20. Tri-Village running back Derek Eyer (20) gains some yardage before Ansonia’s Matthew Shook (15) catches up to him during Friday night’s final home game. The Tigers defeated the Patriots, 42-20. Running back Devin Sink (2) gets back on the field for Ansonia Friday night after missing several weeks. The Tigers defeated the Patriots, 42-20. 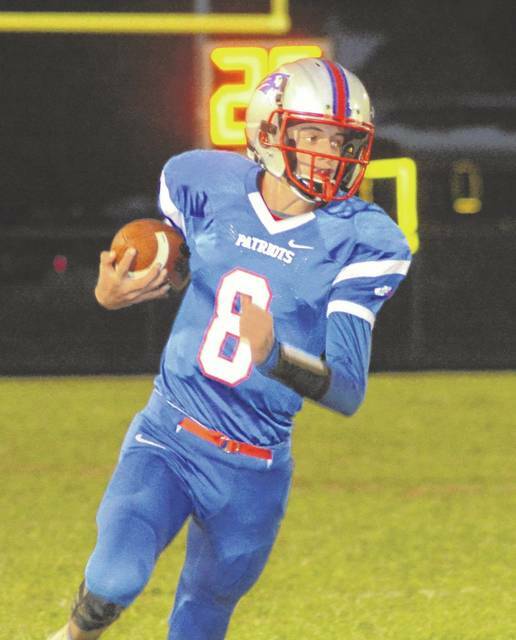 Tri-Village quarterback Layne Sarver (8) takes off on a run during the Patriots final home game of the season against Ansonia on Friday night. The Tigers defeated the Patriots, 42-20. Tri-Village quarterback Layne Sarver (8) backs his way through the pile for short yardage on Friday night during the Patriots final home game of the season against Ansonia. The Tigers defeated the Patriots, 42-20. Ansonia running back Matthew Shook (15) takes off through an open space in the line against host Tri-Village on Friday night. The Tigers defeated the Patriots, 42-20. NEW MADISON – It was a close ball game going into the second half as the Patriots made a determined bid to upset Ansonia. The Tigers were coming off of a 43-0 drubbing of Twin Valley South and may have been a bit overconfident coming into the game, but the Patriots played inspired football in the first half and fought their way to a 14-14 halftime tie against the second place Tigers. 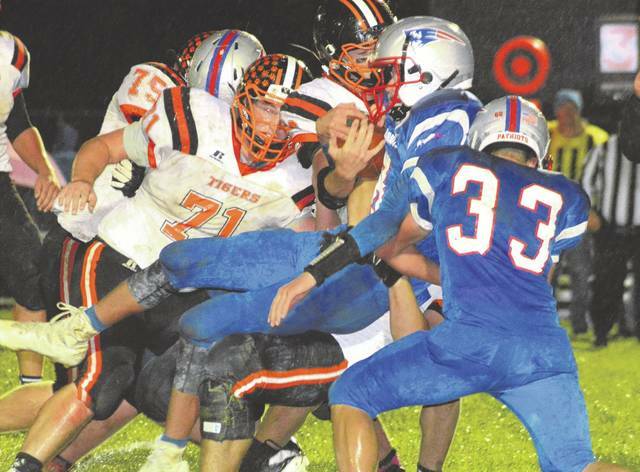 They could smell an upset, but penalties and a strong second half for Ansonia doomed the Patriots, who would only score once more in the game as Ansonia turned up the heat on a cold and rainy night for a 42-20 win. After seeing how Ansonia had problems against National Trail’s spread offense, the Patriots kept their offense spread out and dared Ansonia to stop the pass. Probably 80 percent of their plays were passes and, for the most part, were effective in the first half. Freshman quarterback Layne Sarver easily found targets and kept the ball moving. The defense tapped into this momentum and had three fourth-and-short situations where they stuffed the Tigers and forced them to turn the ball over on downs. One of these stands was on the 1-yard line where it was fourth and goal and another was on their own 7-yard line. But in the second half Ansonia dialed up the pressure and started to reach the quarterback for sacks. Then penalties put the Patriots in third-and-long situations where the short, quick pass couldn’t be utilized. The Patriots had eight second half penalties while the Tigers only had one. The Patriots almost got a late score when Josh Scantland caught a pass for 68 yards and was tripped up on the 1-yard line, but the Patriots could not punch it in. On fourth down, Hunter Buckingham picked off the pass and that ended the last drive of the night for Tri-Village. For its part Ansonia used the run, but mixed in the pass effectively. Big plays were the nature of the night as the Tigers would plug away for 3-4 yards a clip, then break open a big run or pass for 40-50 yards. 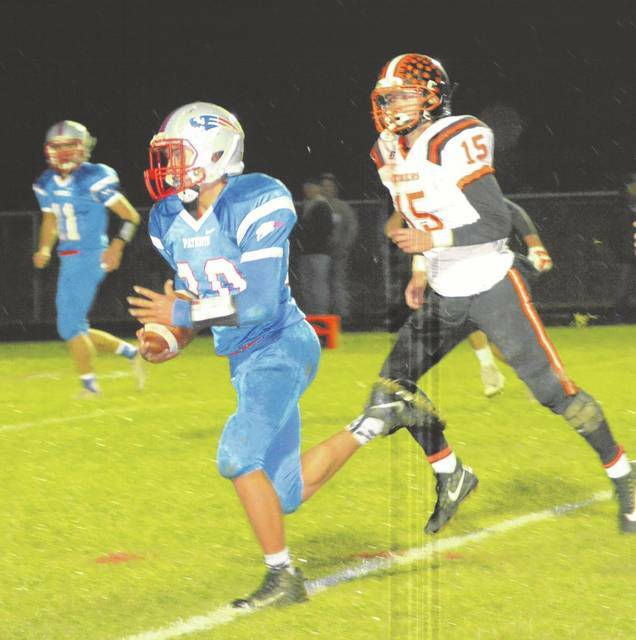 Scores for Tri-Village were by Layne Sarver on an 11-yard run; Derek Eyer on a 21-yard pass from Sarver and Austin Bruner on a 33-yard pass. 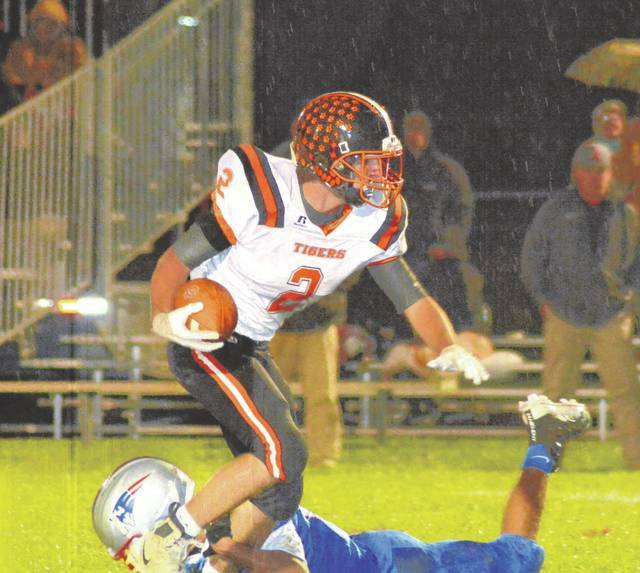 For Ansonia, Hunter Muir caught a 21-yard TD pass from Hunter Buckingham; Reece Stamman had a 7-yard run; Matt Shook a 21-yard pass and Stamman two more times in runs of 42 and 4 yards respectively. “We played with them a good bit of the way, but a big game changer was when we got a defensive stop but then fumbled the punt and gave them good field position,” Tri-Village coach Robert Burk said. “We made some penalties in some bad spots where it really hurt us. But I am glad with the way our guys fought against them. Ansonia is a very good team. They run the ball and to win you have to stop the run. We knew we could throw the ball, so we did that and just ran the ball a few times. We disrupted their run game and forced them to throw. But to their credit they were able to hit their passes. 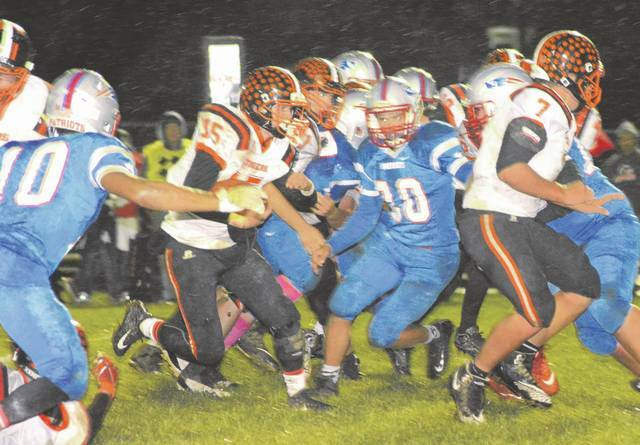 “I want to congratulate the Tri-Village football team,” Ansonia coach Eugene Hoening said. “For most of the game they outplayed us. They came out motivated and they were beating us to the punch on the line of scrimmage. They made big plays and kept us on our heels. Whatever their coaches did to get their kids ready for this game worked so I have to give a lot of credit to Tri-Village’s staff and team. They played one heck of a game. I thought they had the momentum most of the game. 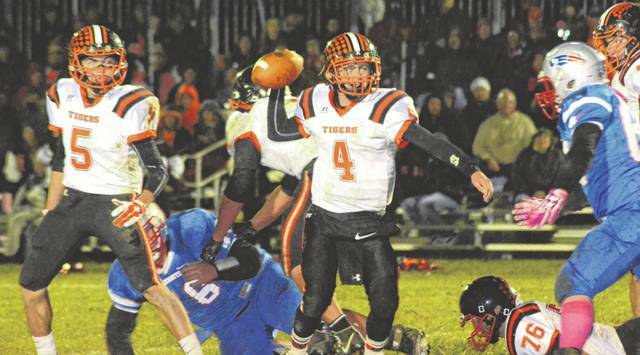 Ansonia returns home next week to host Bradford, while Tri-Village travels to Arcanum. This entry was tagged Ansonia Tigers, Austin Bruner, CCC, Eugene Hoening, Hunter Buckingham, Hunter Muir, Layne Sarver, Robert Burk, Tri-Village Patriots. Bookmark the permalink.